[September 9, 2013] A fundamental attribute of the senior executive leader is the ability to build trust and confidence in the people who work for us, supervisors, peers and associates, and clients. Building and management of that trust and confidence ranks as one of the top factors to achieve and sustain high levels of organizational strength. It is also a measure of the senior executive leader’s successful performance. 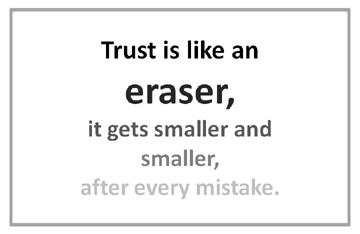 To lose that trust and confidence is easy. A loosely translated and often quoted Dutch proverb says “trust arrives on foot, but departs on horseback.” Another way to interpret the proverb is to say that a single stupidity can ruin your reputation that took years to build. For those of us at the senior executive level, this is intuitively obvious; we could not have achieved this status without our personal efforts to realize this very trust and confidence. Good communications, breaking down information stovepipes (or silos), making it easy for everyone to interact, and building a culture of open dialogue and truthfulness goes a long way to ensuring the maintenance of that trust. Under the rubric of the “Art of Senior Leadership”, personal relationships enable leaders to build the trust and confidence that all organizations need. Of course, trust and confidence is very labor intensive, is built over time, and cannot be “surged” like personnel, equipment, and money can be when needed to accomplish a task. As senior executive leaders, we should always be on the lookout for opportunities to improve upon professional relationships and to know that this is one of the senior leader’s most valued and irreplaceable commodities. The personal skill sets required to build and maintain trust and confidence starts with a high level of maturity and confidence in the senior executive leader. Humility is another (a future blog post on this topic). 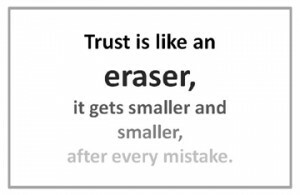 Senior executive leaders should be mindful that they occupy a position of trust, and to sacrifice or to lose that trust is far easier than we think. Trust and confidence will be a recurring theme in this blog, for it is the foundation that supports the pillars of our organization and is the means for measuring success.